Custom water features add depth and dimension to geometric shaped pools. When looking for pool remodeling ideas, most homeowners think of adding an inground spa first. An elevated, custom built spa with a spillover into your pool is a popular way to add dimension and makes for an impressive focal point, taking a simple geometric shaped pool from standard to stunning. Design options are endless when combined with custom lighting and decorative stone or tile. While adding a spa to your existing pool can be one of the pricier remodeling options, it brings an entirely new shape and style to your pool and makes a big impact on the look and feel of your entire backyard. They also change the way you use your pool, adding more opportunities for relaxation and extending the swimming season into the cooler months. 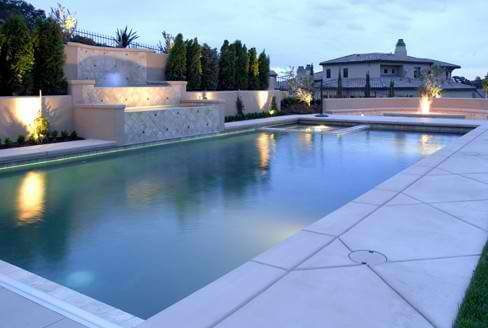 Adding a custom spa to your existing pool enhances your pool experience and extends your swimming season. dollars. Pool waterfalls offer an equally dramatic impact at a fraction of what a new spa will cost. From bubblers, fountains and deck jets to grottos and pool waterfalls, water features are certainly the way to go if your looking for a big impact on a budget. If you’re simply trying to update the look of an old pool, tile and coping are usually the way to go. Like shag carpet in a house, nothing dates a swimming pool more than old fashioned tiles. You may be surprised at how cost effective pool tile replacement can be, and you’ll be amazed at the difference this one change will make! When it comes to tile and coping, you’re spoiled for choice. From modern glass tiles to natural stone tiles, we’ll help you sort through the sea of pool tile options to find the style, color and texture you’re looking for. Pool remodeling doesn’t have to be confined to the water. Adding or extending a pool deck can transform the way you use your pool while also bringing warmth and style to your outdoor space. We offer options to fit any budget. One popular and cost effective option is a stamped concrete overlay, where we take an old concrete slab, pour a thin layer of new concrete over it, and stamp it to resemble tile or stone. We can also add walkways and stone steps to integrate the surrounding landscape and make the pool area a natural extension of the home.